You may have noticed that there are a lot of superhero movies being made these days. There are probably lots of cultural and societal reasons for that, but that’s a discussion for another time. What I want to talk about is that, while there may be a lot of superhero movies being produced right now, there are even more complaints about those superhero movies. Oh, the complaints aren’t that the movies are too childish, too fantastical, too removed from the real problems of the world–no, no, none of that. The complaints are that DC can’t seem to get its act together to make a decent movie based on one of its iconic characters. Well, except for Batman. They’ve done quite well with Batman, though that last movie was a little confuddled. The Superman movie got exposed to too much kryptonite, Wonder Woman is somewhere lost in time and space, and the Justice League is stuck in the clubhouse for the foreseeable future. Meanwhile, the other Big Comic Name, Marvel, has been rolling out great superhero movies one after the other. Spider-man (I, II, and III, plus a reboot with The Amazing Spider-man), Iron Man (I and II), Thor, Captain America, and, of course, last summer’s superpower-level blockbuster, The Avengers. So, why can Marvel manage it, but DC falls out of the sky? 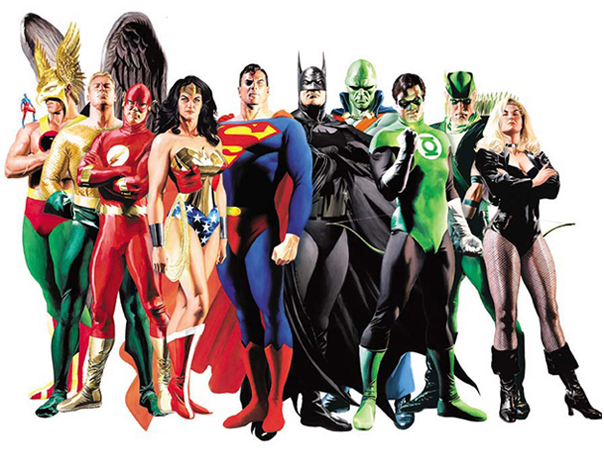 The DC Big Three–Superman, Batman, and Wonder Woman–are staples of American culture. They are so entrenched in the American psyche that even people who have no interest in comics, in superheros, or even in escapism, know who these characters are and probably even something about their backgrounds. And all this, mind you, even before the characters entered the mainstream through TV shows and movies. Before the movies, you could very likely go out to any Midwestern farm, track down a farmer on his tractor, ask him who Superman was, and he could tell you. Same for Batman, and the same–although he might have been more loathe to admit it–for Wonder Woman. But Iron Man? Who the heck is Iron Man? Some comic book dude made out of iron or something, right? Thor? Never heard of him. Captain America? Maybe. Spider-man? Okay, sure, he probably heard of Spider-man. I’m not saying this line of reasoning is perfect. However, Spider-man was always second tier to the Big Three: Superman, Batman, and Wonder Woman. You probably wouldn’t find Peter Parker having coffee with Clark Kent, even though they’re in the same business–both in and out of costume. What Marvel was able to do by taking lesser known characters and putting them up on the big screen, was to introduce them to the movie-going public in a fresh way. I read a lot of comic books as a kid, but Iron Man? He seemed boring. But Marvel took the character and made him bigger than he’d ever been in the comics. So big, in fact, that now Iron Man is one of their own iconic properties. So big that if a Marvel movie doesn’t have a Robert Downey Jr (the actor playing the part) cameo in it, then it’s failed on some substantial level. True, DC succeeded with the Batman franchise. In a way, though, this is because Batman is a lot like the second-tier superheroes of the Marvel universe: he’s fallible. He’s human. He’s just like us, only with more money. We in the audience know that we can’t ever be Superman or Wonder Woman. Those characters were born to their parts, but if we won the lottery, then maybe, just maybe, we could be Batman. So the other reason that most of the superheroes–at least the ones doing well at the box office–from the Marvel universe are doing well, is that the majority of them are just regular people who have been given extraordinary powers, be that from a spider bite, from the exploitation of high tech, or from super science. Sure, there’s Thor, but he gets away with it because he’s one of those lesser-known characters I was talking about. Anyway, given all of this, what can DC hope to do to change their fortunes? It seems obvious: they’ve got to get away from focusing on the Big Three and focus, instead, on their second-tier characters: Flash, the Martian Manhunter, Plastic Man, and, er…Green Lantern. Okay, maybe it is poor management, bad directing, and terrible writing after all. If you’d like to see a superclip of every superhero movie ever made, check this out: http://blastr.com/2012/04/epic-supercut-swarms-with.php That’s also where the author found the pic at the top of the page. This entry was posted in Reviews and Rants and tagged Batman, Captain America, comics, DC, Flash, Green Lantern, Iron Man, Justice League, Martian Manhunter, Marvel, Plastic Man, Spider-man, superhero movies, Superman, The Avengers, Thor, Wonder Woman. Bookmark the permalink.